There is a lot of talk these days about the legacy we will leave our children and our grandchildren. When I stare into the immediate future, I see a frightening legacy caked in darkness and famine. Instead of intelligently preparing, we find ourselves whittling away this precious time chasing fraudulent theories. We have a decade to prepare, but have a misguided sense of direction and urgency. Climate change is primarily driven by nature. It has been true in the days of my father and his father and all those that came before us. Because of science, not junk science, we have slowly uncovered some of the fundamental mysteries of nature. Our Milky Way galaxy is awash with cosmic rays. These are high speed charged particles that originate from exploding stars. Because they are charged, their travel is strongly influenced by magnetic fields. Our sun produces a magnetic field that extends to the edges of our solar system. This field deflects many of the cosmic rays away from Earth. But when the sun goes quiet (minimal sunspots), this field collapses inward allowing cosmic rays to penetrate deeper into our solar system. As a result, far greater numbers collide with Earth and penetrate down into the lower atmosphere where they ionize small particles of moisture (humidity) forming them into water droplets that become clouds. Low level clouds reflect sunlight back into space. An increase in Earth's cloud cover produce a global drop in temperature. These periods of quiet sun are referred to as a Grand Minima. 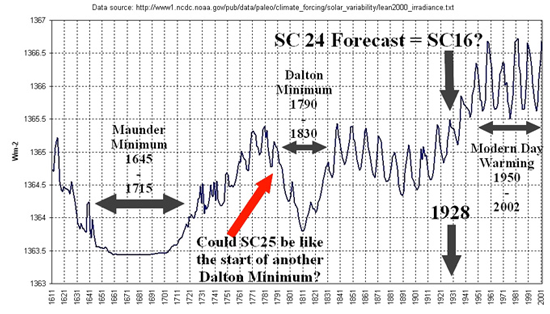 The Maunder Minimum (1645-1715) and the Dalton Minimum (1790-1830) are examples.